The Climate Communication Project is a collaboration between academics and practitioners working on public engagement with climate change. Through an ‘audit’ of UK capacity and expertise on climate change communication, a synthesis of key research findings, and by listening to a range of community groups’ views and needs, the Climate Communication Project is producing a new resource that will help catalyse public engagement with climate change. RESONATE WITH THE AUDIENCE: POSITION CLIMATE CHANGE AS PART OF EVERYDAY LIFE Find out what the audience knows; what their values, beliefs and attitudes are, and build/tailor engagement around this. Connect with what matters to them, use shared language and trusted, credible communicators where possible. Make communications personally relevant and familiar. Show how it will affect the audience directly (e.g. make links to human health, politics, everyday activities). SHIFT FROM THE GENERAL PUBLIC TO SPECIFIC AUDIENCES A shift towards more specialist or targeted activities is a potentially important future direction for the field. Practitioners highly valued receiving positive responses, high turnouts, stimulating engagement and dialogue, reaching a new audience and successfully tailoring engagement. Currently however, practitioners are mainly reaching out to the general public. BE ENGAGING AND BUILD BALANCED OPTIMISM: FOCUS ON DIALOGUE AND CO-PRODUCTION Hold people’s attention, be concise, get to the crux of the communication quickly and make it interesting. Practitioners recommended using visuals, stories, narrative, humour and other creative forms of engagement to build a sense of optimism about tackling climate change. Two-way dialogue is crucial: learn together, avoid preachy, ‘didactic’ communication, and don’t persuade forcefully. INCREASE AWARENESS AND UNDERSTANDING: PROVIDE SCIENTIFIC CLARITY AND ACCURACY Stick to the well established areas of science, repeat the basics, and be accurate. Be as simple and direct as the science allows. CATALYSE CHANGE: NURTURE AGENCY AND EMPOWERMENT Help the audience to realise what they can do themselves and realise key actions they can take; encouraging a sense of control and efficacy. Catalysing change could be a conversation, a behaviour or getting politically active. SCIENTISTS CAN HAVE OPINIONS Robust scientific evidence should be at the heart of climate communication, but this doesn’t mean scientists can’t advocate for policies or use evocative communication methods. 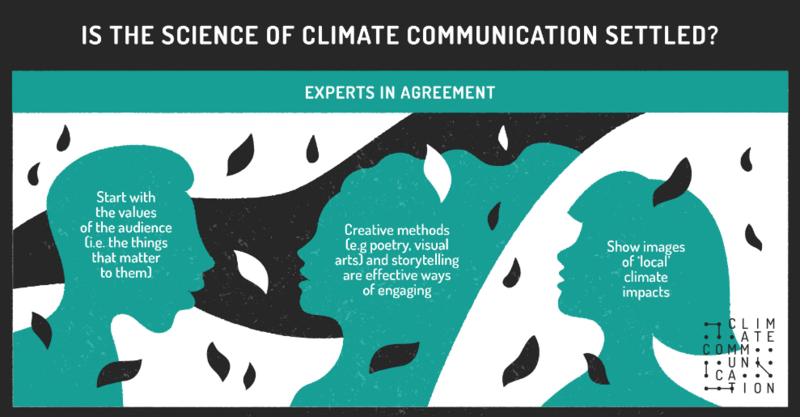 Engaging with audience values, and using creative and storytelling approaches were judged by most as being valid and effective approaches to climate change communication – not simply ‘sticking to the facts’. INVESTING IN THE INFRASTRUCTURE FOR PUBLIC ENGAGEMENT ON CLIMATE CHANGE IS IMPORTANT One of the key areas for improvement that practitioners identified was around the frequent absence of evaluation or longer term follow-ups to measure whether activities were effective or not. But evaluation requires investment in the infrastructure for public engagement, and support for communicators from across a range of sectors to do their work effectively. MAINTAIN AND BUILD LINKS BETWEEN RESEARCH AND PRACTICE As the Climate Communication Project moves forward, with the aim of securing further support to build on our initial conclusions over the coming years, we will continue to provide evidence-based resources for climate communicators, maintaining and strengthening links between research and practice around public engagement with climate change.